“Names — whether of a sea hare or of someone you meet at a dinner party — are the first steps in creating a relationship.” An absolutely heartfelt read by UC Davis grad student, Grace Ha, on the depth and story behind scientific (Latin) names of organisms and the touching reason behind her choice of a new species’ name. We know graduate school can be challenging for the mental health of students. Two recent articles bring attention to how a toxic work environment and financial struggle compound the stress of pursuing a graduate degree. This is the first installment of a blog series about how to overcome career barriers, and we are excited for the subsequent posts. This first essay discusses how understanding that moving through career stages requires consistent improvement of skills over time, as opposed to the narrative our brains sometimes tell us about how folks we admire must have been inherently skilled from the start. And there are cartoons. Though rain has finally come to California, the recent wildfires were intense and devastating. This article discusses the impacts on research and higher education. If you are able, consider donating to help with the fire recovery effort. Another claim of aliens to file under: Probably Not Aliens. Have you backed up your research work lately? Don’t wait for a computer disaster to strike before making a plan for how/when to store your files. One of my go-to animal fun facts has always been cube-shaped wombat poop, but I didn’t realize quite how mysterious this process was until recent research surfaced attempting to answer “What the what? HOW?!”. What a cool animal physiology/mechanical engineering crossover! Check out the Feeder Flock, a new closed group on Facebook for 18-35 year olds who feed wild birds. The group is being run as a trial from Fall 2018 – Spring 2019 (at which point they will decide upon its future). It’s hard to beat the descriptive ability of this next article’s title, How Close-Up Glamour Shots Are Generating Buzz for Bees. Sam Droege, a wildlife biologist at the Patuxent Wildlife Research Center, is fulfilling our deepest, truest desire for adorable critter photos along with his other duties at the USGS. OMG HE HAS AN INSTA! Best acronyms award goes to the research gathering data on how long it takes a plastic toy piece (e.g. a LEGO head in this trial) to worm its way through the body. Peru recently established Yaguas National Park, a 2 million acre Amazonian preserve that’s both a biodiversity hotspot and a spiritual nexus for local indigenous people. 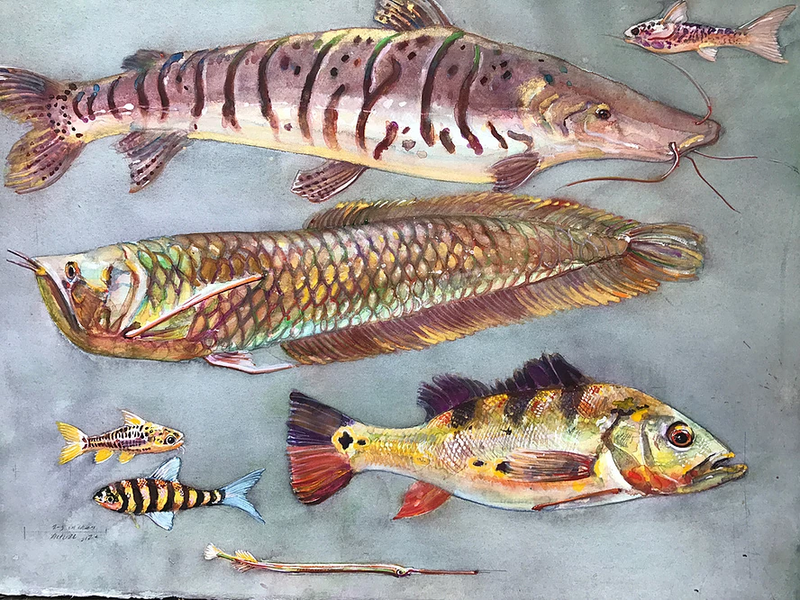 A lot of hard work went into this achievement including watercolor artist, Peggy Macnamara. Friend of STS, Dr. Marta Shocket, was interviewed by The Naked Scientists podcast about how climate warming will affect transmission of Ross River virus & why Australia is the perfect place to study how temperature drives mosquito-borne diseases! The full episode is #51 of the eLife podcast “Transmissible Tumors and LSD Receptors” (https://elifesciences.org/podcast). Big Cow is actually a Big Boi but also standing next to smaller breed cows. Posted on November 29, 2018 December 19, 2018 by Sweet Tea, SciencePosted in Astounding, Citizen Science, Conservation, Interesting, Link ParTEA, National Parks, Reading, Relaxation, Scientific Communication, the power of wordsTagged Link PartTEA, Sweet Link ParTEA.